We use directional boring technology as a cost-effective way to maintain the beauty of your home’s landscape. The major benefit of trenchless boring technology is that it keeps property damage at a minimum and is, in essence, kind to your yard. Part of the ongoing 3 Mountains Plumbing mission is to leave your home cleaner than how we found it, and our trenchless solution helps make that happen. Directional boring, also commonly called horizontal drilling, simply stated, is a method of installing underground pipes. At 3 Mountains Plumbing we typically use directional boring technology when it comes to replacing pipe in water main lines. In Portland, water main line pipes connect the full distance between your home and your home’s water meter, typically located on the other side of your front yard, at the sidewalk. Directional boring is the natural choice for homeowners wanting to save their lawns from destructive plumbing work. It’s unsightly not to mention inconvenient for you and your family. How Does Directional Boring Work? Our directional boring machines (pictured) are operated only by our trained and experienced journeymen plumbers. The process works by drilling a bore head into the ground at a horizontal angle, thus minimizing landscape damage. The technology is precise and efficient. Piping problems are fixed directly at the root of the leak or break. There is no contest between trenchless direction boring technology and traditional methods that involve a lot more digging and mess. Direction boring has become more or less common practice and is certainly the preferred choice at 3 Mountains Plumbing for the following reasons and more. 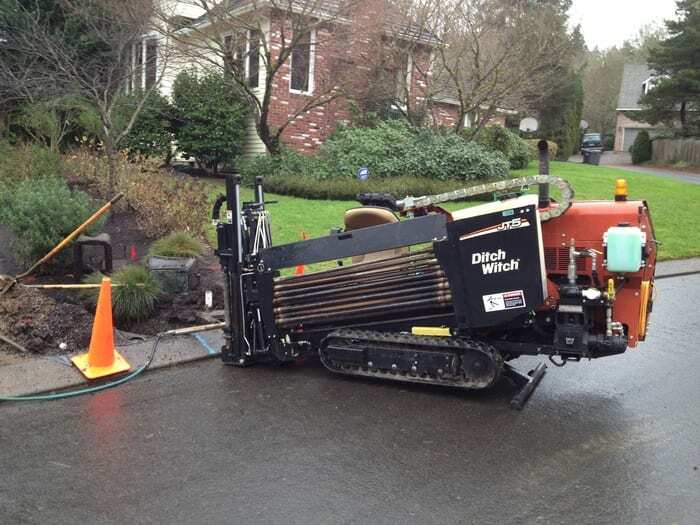 Contact 3 Mountains Plumbing to help clarify any questions you have about how our directional boring technology can help you and your Portland home’s water main line. Thanks for helping me learn more about directional boring. It’s good to know that homeowners can use this boring for lawns that may be suffering from destructive plumbing work. That said, I’m kind of interested to learn if the method of the directional boring would depending on the size of land.